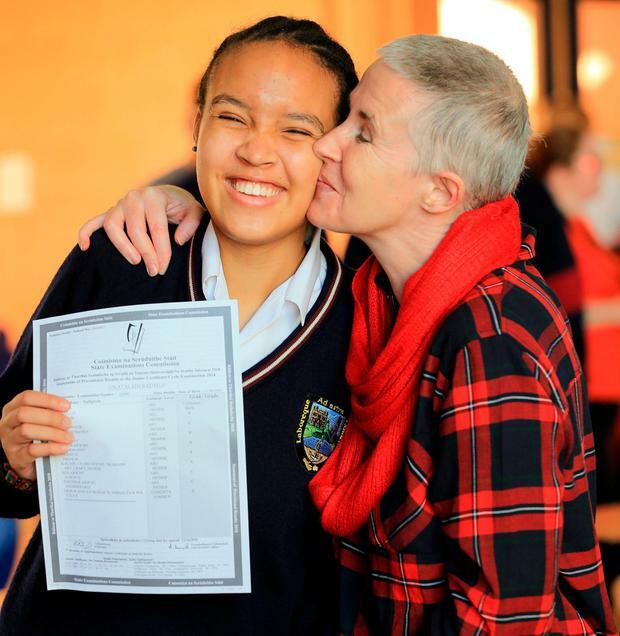 After months of study and fighting back the nerves, the pay-off came for almost 150 pupils at one Dublin school as they collected their Junior Cert results. Many were feeling nervous as they waited outside the principal's office at Donabate Community College in north Co Dublin yesterday morning. However, the atmosphere quickly turned to one of excitement as most students were thrilled with their grades. Matthew Crowe (15) and Alannah France (16), both from Donabate, received the highest marks in the year, receiving an impressive six As and two Bs each - and it was all down to hours of study and hard work. "I took a break on the weekends but I would study an hour, maybe two every day after homework," said Matthew. "I'm really happy," said Alannah. "I did a lot of study." "We're going for breakfast and then dinner with all my friends (to celebrate)," she added. Jenny Thompson (16), from Swords, said the majority of her classmates were nervous before they sat their exams, but reckons the thought was far worse than the reality. "I'm really happy. I put in a consistent effort. "Generally, everyone was quite nervous I think. "It was more the idea around it rather than the exam itself," she said. There was universal agreement among the students that the mock exams they sat in January were harder than the Junior Cert, meaning they were well prepared for the real thing in June. "I'm delighted," said Sinadalahi Badmus (15), from Donabate. "I thought I would fail a lot of the subjects, but I got really good marks. "The mocks were definitely harder. The Junior Cert I was like, 'oh, this is actually pretty easy'. The mocks were preparing you. "I'm pretty proud of myself." Many students told how they were planning to hit the dance floor at The Wright Venue in Swords, Co Dublin, yesterday evening to celebrate. Principal Anthony Creevey said the students had worked very hard over the last year to achieve their grades. "We're very happy with the results overall. The trend seems to be very good. "We have a lot of very happy students and very happy parents," he told the Irish Independent. "We had 146 students this year. They all worked hard and they are a great bunch. They're very well behaved and I'm delighted they got their rewards." Rebekah Leamy wasn't sure which strand of science she wanted to pursue at third level, so settled on a broad-based CAO entry route to keep her options open. Although medicine was his initial preference, Ayman Yousif is happily settling into the Pharmacy degree programme at Trinity College Dublin. Amy Martin always wanted to be a nurse but she wasn't confident of achieving the CAO points necessary to gain entry to this highly competitive field of study.